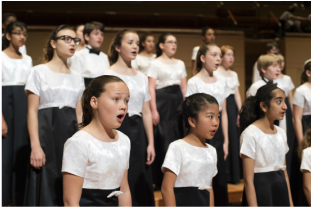 ​Led by Terrie Preskitt-Brown, CCGD's Concert II Chorus is an advanced children's chorus. This chorus rehearses on Monday evenings from 6:30 – 8:00 p.m and approximately two Saturday mornings or afternoons a semester at Lovers Lane United Methodist Church, 9200 Inwood Road. The chorus performs at least two to three times each semester and performs with the Dallas Symphony Orchestra annually. Tuition is $595 per year.